With summer winding down, I’m finishing up a middle grade novella with our teenaged daughter, but I’m already gearing up to start my rough draft for my newest contemporary romance series, Surrendering Opinions. This will be a 6 book series about “The Connor Six,” sextuplets kept in the national spotlight because of tragedy. Each sibling will have their own story, and the first book, Anchored, is about the oldest, Jordyn. Jordyn wants to honor her mother’s memory by pursuing a career in broadcast journalism, but she’s driven by much more. Her eyes are set on the national scene where her “Aunt” Julia is one of America’s treasured icons. Problem is, Jordyn is at the local level, going nowhere. She also feels responsible for watching out for her other siblings and her dad, now remarried. I’m still plotting this out, but one thing I know, there will be an office romance. I thought this was a plot that might be in danger of overuse, but when I tried to think of books and movies that used this device, I came up with almost a blank. The one that popped up first was a movie, The Proposal. I am a sucker for this Ryan Reynolds/Sandra Bullock flick about a horrible mean boss who manipulates her assistant into pretending to be her fiance. The conflict is off the charts, but the sparks are there as well. What made me love this one is with excellent character layering, we learn why the boss is the way she is, and instead of hating her, we root for her. In Anchored, my plan is to have colleagues clash, and that’s where I’m coming up empty thinking of other books, TV shows, or movies that have used the same idea. An easy one is Jim and Pam from the American version of The Office. They didn’t clash though, but they worked in the same environment. I could say Superman, but it was Lois and Clark who fought for the stories at The Daily Planet. Ziva and Tony on NCIS, but their romance finally came into play once the actress who played Ziva left the show, and they wrote the romance in. I think there are detective shows out there, but usually it is a detective falling for a client, or a boss and employee, a la Moonlighting. When it comes to books, I remember military romances where the husband passes and the widow falls in love with the best friend that promised to protect her. The construction worker who tries to deny his feelings for the woman who lives at the house he’s fixing. The doctor who finds much more after saving the life of a patient. The teacher and the single dad struggling to raise the child who is acting out in class. I can think of plenty of those work-related plots, but the actual work romance? Maybe it isn’t as used as I thought. 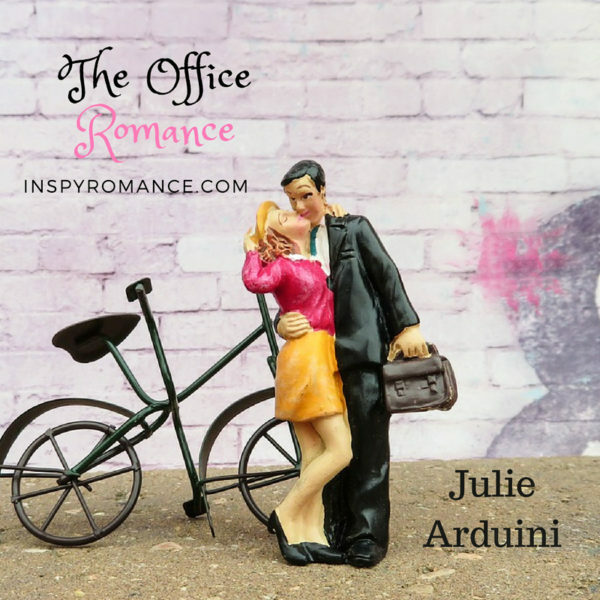 Can you think of anything that is an office romance featuring colleagues, whether doctors, teachers, lawyers, police officers, soliders, or broadcast journalists? What kind of conflict do you like to see with this type of love story? I have ideas already forming, and I’m excited to get started. My first thought was the TV series, Bones. I haven’t watched it in a long time, but she’s a renowned something (scientist who studies bones), and he’s an FBI agent that needs her help solving crimes. They clash at first, but eventually get married. In the same series, Angela and the rich guy (can’t remember his name) clash at first, but also eventually marry. I never watched it, but Bones is another one. Ellie, Hmm, I’ll have to check that out! The TV show Castle was a favorite of mine. Love Proposal. It’s one of those movies I’ve watched several times. I never saw this one, either, but that’s another great example. I think some of Heather Gray’s stories might fall into this category, if you’re including hospital settings. Elizabeth Maddrey’s Operation Valentine might be what you’re looking for, as well. I don’t watch TV or movies so I can’t help you there! Great ideas, I’ll have to check those out! I forgot about Hannah Alexander, I think they have done hospital setting romances, too. I appreciate the encouragement, I’m looking forward to the new series! I enjoyed The Proposal. Thinking I will have to see it again soon. Fun post and looking forward to reading the series Surrendering Opinions. Thank you! I hope you enjoy the new series once it’s available! Sounds like a fun book, Julie! :) I’m the odd person out who did not enjoy The Proposal. I did a Google search and came out up with some gems of office romance movies, Broadcast News among them. I remember really enjoying that one. Others are: No Reservations, What Women Want, Two Weeks Notice, Superman, Lover Come Back (Rock Hudson and Doris Day in a follow-up to Pillow Talk), Working Girl, Jerry Maguire, His Girl Friday…and there’s also Bridget and Daniel Cleaver in Bridget Jones’s Diary. I have an office romance in one of my Lewis Legacy Series books (he’s the oil magnate/widower and she’s been hired as the CEO). The book’s not about how they clash but rather how they work together toward various goals and fall in love in the process. And that, after all, is what we hope our readers want. :-) I know there are many more examples out there, and I’m sure you’ll discover some in the comments. Blessings! Forgive my typos in my post…on the fly! Thanks, JoAnn! I was trying to remember Broadcast News and couldn’t come up with it. I love the angle you used with the Lewis Legacy Series. There’s much to think about with the office romance plot device! And DUH, I’m on a roll today. She was hired as the CFO, to be clear in Abide. ;-) I should just step away from the computer today. I didn’t have my coffee this morning. Maybe that adds to my alertness more than I realized… Blessings. I’ll look forward to your book! this sounds wonderfully engaging. Bones and Castle are good ones. wish you lots of luck. Hi Julie. In our local Michigiana (SW Michigan / Northern Indiana) Channel 16 WNDU has an anchor team (couple) Terry & Mauren McFadden. They have been reporting the evening news for over a decade. Otherwise my favorite TV couples are Bones and Castle. While teaching, we had a romance among two teachers, which made the school board unhappy, even though there were several married couples on staff. Thanks for the blog. Best wishes and happy writing. I can’t remember if I saw the pro pal or not (I have trouble remembering titles but will remember after seeing a little bit. Book the same way some time if they were read recently) so I will be watching for it to see if I have seen it before. The title does sound familiar. Sorry I can’t remember, but I do love good books and I know I love your books. It sounds like this will be a very interesting series. I really enjoy series that focus on different members of the same family because I get to know different characters but can still keep up with the others.